An Ikeja High Court on Tuesday adjourned the N150bn libel suit filed by former Lagos state Governor, Chief Bola Tinubu, against African Independent Television to September 30. 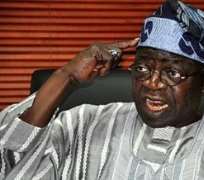 The News Agency of Nigeria reports that Tinubu had instituted the suit against Daar Communications Plc, owners of AIT, for airing of a documentary titled 'Lion of Bourdilion'. He had alleged that the documentary aired on the television station's channel was libelous and was aimed at tarnishing his image. During Tuesday's hearing, counsel for AIT, Mr Jeffery Kadiri, told the court that he had filed all the necessary pleadings in the matter. Responding, Tinubu's counsel, Mr Ademola Adesiyun, asked the court in a motion dated June 26 for extension of time in which to file a reply to AIT's statement of defence and counter-claim. In the counter-claim, AIT listed its Chairman emeritus, Chief Raymond Dokpesi, and seven others as witnesses to testify against Tinubu. Others listed to testify were Namure Edoimioya, Chief Medan Tenke, Ajibola Adewusi, Olumide Idowu, Chief Stanley Odidi, an engineer, Mr Nwabueze and Dr Stanley Bassey. The television station also denied each and every allegation of facts as contained in the claimant's amended statement of claim. Dokpesi, in his statement on oath, averred that Tinubu's claim was founded on a non-existent ground because the said documentary was not titled 'The Lion of Bourdilion', but 'Unmasking the Real Tinubu'. He asserted that the documentary, in his honest opinion, was not false and was not aired out of malice to the person of the claimant. He further affirmed that the content of the documentary were facts which had been in the public domain for over two decades.